On Monday, August 31st, I could enter no more code. It was done, complete, or as much as it could be with the time invested. I had finished my entry for the Riot Games, API Challenge #2. I had created and submitted PowerSpike. The API Challenge I took part in was to create a web application that referenced data sets from before and after a massive itemization change that Riot made to their game, League of Legends. When I read the requirements, it sparked an idea. What DID the data look like for champions as they got kills throughout the game? How many kills in each minute of a game, does a particular champion get on average, and how did those item changes affect that? And so I set out to satisfy that curiosity. I began work on an application called PowerSpike, using NodeJS to serve up a web server, as well as run the parser which would collect the data. Those two parts contain much of the application code. First, the parser runs through each match, pulling down the data from the API and reading in the kill data for various champions in each match. I chose to use the four data sets for the North American data, since those are the servers I play on and I wanted to limit the amount of data to specific regions. When the parser starts up, it checks each of the matches in the riot test data files against a list of match IDs that have been parsed already and if they haven't been parsed already, it queues them up to be run. Then it gets the data, grabs the kill times for each champion and stores that data in MongoDB as kills per each minute. It does this slowly, waiting between each request so we don't hit rate limits by the API. The other half of the application is the web server which exposes a few endpoints for data retrieval from MongoDB, as well as the client static pages, which display the data in line charts over time throughout a game. Chart.JS is the library for displaying data that I used and it's pretty good at the basics. Each of the four data sets gets compared to one another. I also modified the chart to allow the user to toggle datasets with the legend as well, since the basic UI can be cluttered. There are some very interesting data points for a few champions as well. 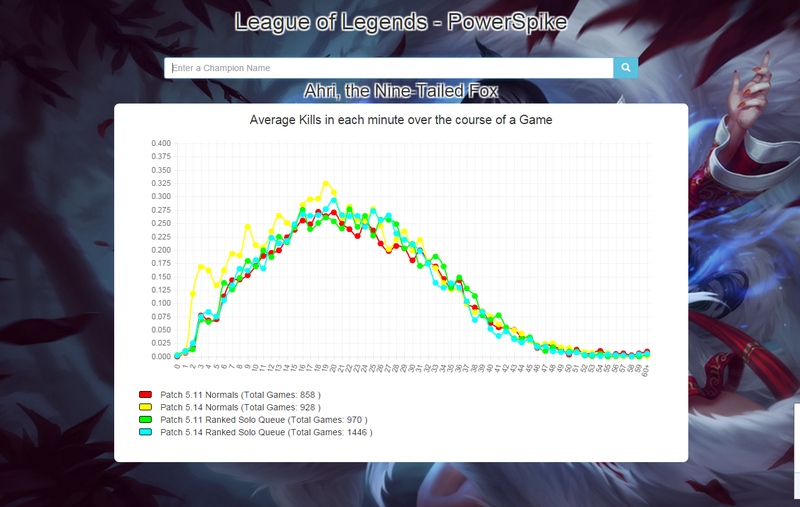 For example, Ahri gained a significant boost in early game kills for normals after the patch. This could be due to the much earlier Needlessly Large Rod that players could now purchase at an earlier time. But either way, the data points are pretty interesting. and there are a few champions like Kayle and Teemo that have some pretty interesting data to look at. I decided to host the project on a web server, so I spun up a new Digital Ocean droplet and purchased powerspike.xyz at NameCheap.com for 1 dollar for the first year. I highly recommend Digital Ocean as I run many of my projects off their boxes. You get full control of the VPS and it's great for being able to do all sorts of interesting projects. It was a pretty fun challenge, and it's now in review for the next month, so we'll see how it goes!